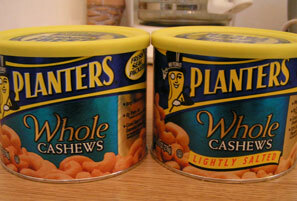 In a "buy one, get one free" deal in which I wanted Planters "Lightly Salted" whole cashews, I accidentally chose one can of regular "This Is A Can Of Salt With An Occasional Cashew" kind. 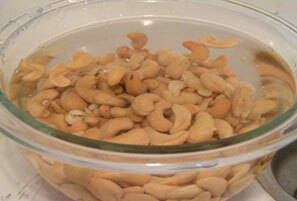 Eating the salt-pile cashews was unbearable, so I devised a method of unsalting them. I'm convinced that this knowledge will change the world for cashew enthusiasts who have had similar purchasing tragedies. 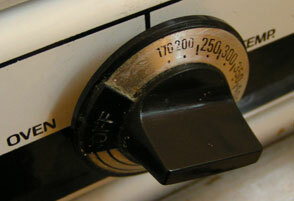 Heat your oven to the lowest temperature possible - we're aiming for around 150-200 degrees, the temperature at which cashews are usually roasted. 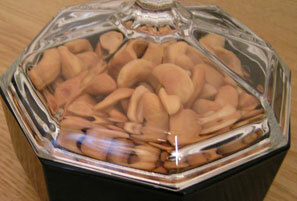 Burnt cashews probably aren't very good, so we want to avoid that. Dump the offending salt-pile nuts into a bowl of hot tap water. Mix them around a bit, then drain the water. 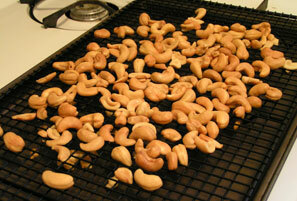 Nobody wants a bunch of wet cashews, so we have to dry them. Spread them out on a baking sheet. I have a cookie-cooling rack, so I placed it in the baking sheet (pictured) so the cashews could have more air flowing around them, but if the little pieces went through the holes in the rack, they'd be safely contained by the baking sheet. Bake them until they're dry. It's hard to tell, because they're coated in a thin film of oil, which won't dry. Mine reached a good dryness after about 20 minutes. It helps if you move them around halfway through the baking. Take them out, move them around, and let them sit for an hour to ensure that they're really dry. Put them in something nice, since the can is still full of salt and it's now falsely advertising the saltiness. Enjoy!